At the Ready has ventured off the beaten path to shed light on a type of emergency that responders do not often talk about; and one in which responders are probably less frequently trained. In 2007, there were 922,095,840 (1) acres of farmland in the United States; nearly 41 percent of total land area. In 2011, there were 2,181,000 farms spread throughout every state in the union. That averages 43,620 farms per state. Chances are pretty good that at some point in your career you will be called upon to respond to an emergency of some kind on a farm. Moreover, “these are not your typical emergencies,” Hill explained in a recent interview. “The kinds of agriculture emergencies that responders can expect to respond to are bad. Tractor overturns are the most common by far. Other typical emergencies involve machinery entanglements, confined space involvements, such as grain bin entrapments, exposure to silo or manure gas, entrapment in silo unloader or grain auger, and falls off grain bins/silos.” Add in highway incidents, as well. Adding to the medical crisis, Hill continued, rural first responders may lack experience dealing with “such high-level trauma.” In addition, “if this happens in a metropolitan area, an on-scene paramedic can summon support from the area fairly quickly, but in a rural community, that paramedic is alone with almost no support,” he said. 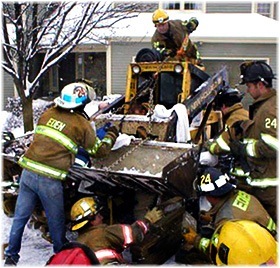 Penn State University was one of the first universities to offer training in agricultural emergencies, starting in the late 1970s when Dennis Murphy, an Extension Safety Specialist, developed a series of videos on various aspects of agricultural rescue that he turned over to the Pennsylvania Fire Academy. After arriving at Penn State in 2001, Hill began finding a new approach for agricultural rescue, drawing on his experience directing New York’s FARMEDIC program for 10 years. “At FARMEDIC, I led the development of the first national standardized curriculum for agricultural rescue. This program was a good one for the time, but with the onset of NFPA 1006 and 1670, that program needed to change. 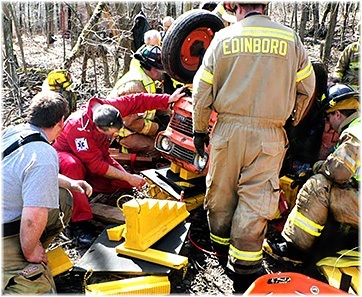 What we have now at Penn State is over 60 hours’ worth of training modules dealing with a host of on farm emergencies (general farm response, tractor overturns, machinery entanglements, farm chemical emergencies, farm confined space emergencies, and animal emergencies). 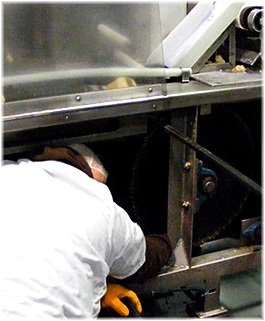 All modules comply with NFPA 1006 and 1670 standards.” In contrast, the FARMEDIC training was 16 hours.